There is no detail yet as to how much over he was above 15 degrees limit. And which one of his deliveries were found illegal. Let's wait for the detailed report. This is a big blow to not only Pakistani but Professor's career also. Whether someone likes it or not but I believe he was helping Pakistan immensely with his 10 economical overs and his stable batting in the middle overs. Without him, others will have to take more responsibility. It may be better for Hafeez to open now with Fakhar, and let Harris Sohail take his place, as he can bowl well. 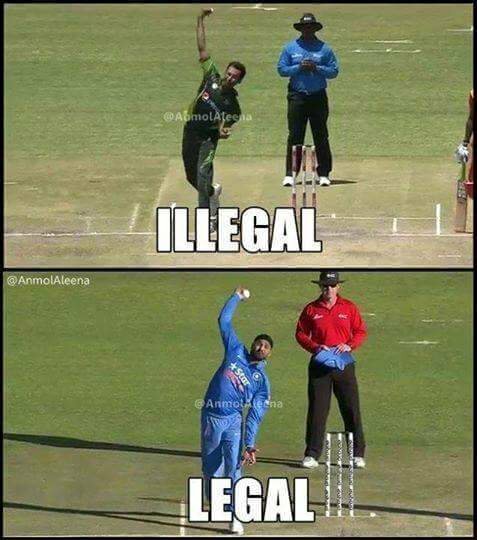 Quote: The law on chuckingÂ Â states that the bend in the bowling arm from the highest point till the point of release should not exceed 15 degrees. The 15 degree point was chosen because that is the point at which the human eye can discern a noticeable chuck in the action. This is important, because every bowler chucks when bowling, but after a certain point we can start to see it. 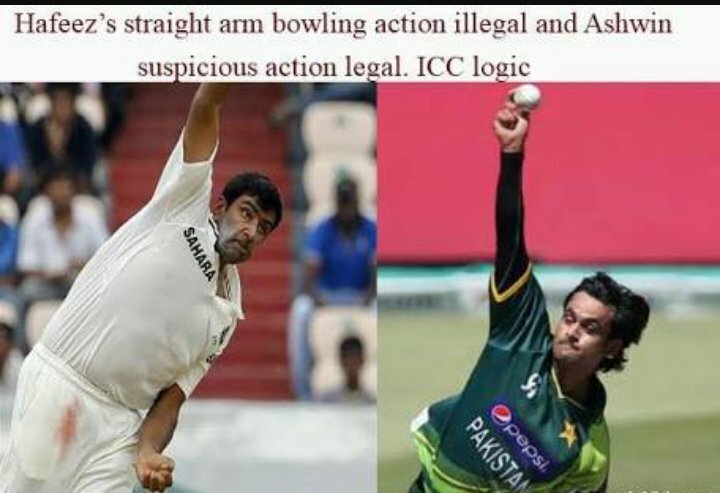 The bowling tests that various bowlers have to go through have the ability to measure this bend in the arm, but as per the rulings, as bowler with 14 degrees is legal and one at 16 degrees is illegal. I was reminded of this when I was reading up on the Sorites Paradox. Here is the wiki page for it. The sorites paradox is a paradox that arises from vague predicates. A typical formulation involves a heap of sand, from which grains are individually removed. Under the assumption that removing a single grain does not turn a heap into a non-heap, the paradox is to consider what happens when the process is repeated enough times: is a single remaining grain still a heap? (Or are even no grains at all a heap?) If not, when did it change from a heap to a non-heap? In cricket, the moment the heap turns into a non-heap, or a bowler becomes a chucker is when it goes a degree above 15, even though the boundary chosen for this point is an approximation. Some people might notice a bend at lesser degrees, which is presumably what happens to bowlers who are called but clear the test (Bilal Asif from Pakistan recently). Others might not notice one that's more pronounced. The problem is that cricket's anti-chucking rules were made with a misunderstanding of the human body (that an arm can have no bend when delivering the ball) and the Murali affair forced science into the matter. This is why many anti-chuckers complain that if unchecked, bowling would become baseball pitching. However, others argue that a bend of 20-30 degrees can be allowed, which is another way of saying that its at a point where adding more degrees hasn't yet turned it into a pitcher's throw. A similar example are the 'umpire's calls' on LBWs, where you often see a situation that a ball is hitting the stumps on the full, but hawkeye decrees that only 49% of the stump was being hit and so it falls over to the yellow category. Ok let's assume that he is a chucker but what about other players!? There is a big list of them....Murlitharan (admit it that he was controversial), Malinga, Harbhajan, Ashwin and the list goes on and on and on. They were never suspended or anything. It seems to me that target is only Pakistani bowlers. (11-17-2017, 03:18 PM) moby Wrote: Ok let's assume that he is a chucker but what about other players!? There is a big list of them....Murlitharan (admit it that he was controversial), Malinga, Harbhajan, Ashwin and the list goes on and on and on. They were never suspended or anything. It seems to me that target is only Pakistani bowlers.